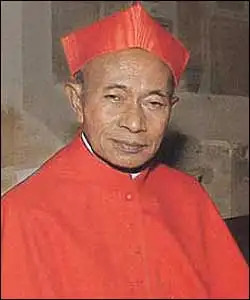 Cardinal Armand Gaétan Razafindratandra, Archbishop emeritus of Antananarivo (Madagscar), was born into a large, old-established family which had become Christian very early on. His father was called Paul Razafindratandra and his mother, Joséphine Rasoanoro. He was born on 7 August 1925 in Ambohimalaza, a locality about 50 km from Antananarivo where his grandfather was governor. He received his primary and secondary education at the parish school of Faravohitra directed by the Brothers of the Christian Schools of Andohalo. He went on to the minor seminary of Ambohipo and finally, to St Michael's College directed by the Jesuit Fathers, where he earned his diploma. He studied philosophy for two years at Ambatoroka major seminary and did a three-year course at St Michael's College. He then returned to Ambatoroka to study theology. After his ordination to the priesthood on 27 July 1954, Msgr. Sartre sent him to the Catholic Institute in Paris, to study at the Institute of Pastoral Catechesis and the Institute of Social Studies, opposite the chaplaincy for Malagasy students. He returned to his country in 1956 and became director of catechetical teaching. He drafted manuals for all the classes aged 12 years and older. At the same time, he was responsible for the spiritual direction of the public and non-confessional private schools: 40 hours a week, all while he was Vicar at the cathedral. He subsequently became parish priest in Ambohimitsimbina and assistant curate in Ambavahadimitafo. He organized entertainment for the children of needy families in summer camps run by young volunteers, which became occasions where he could demonstrate his own capacity for animation. For 10 years he directed the recently founded National Centre for Catechetical Formation. His experience continued to be enriched by his posts as Rector of Faliarivo minor seminary and Director of the major seminary of Ambatoroka. He was appointed Bishop of Mahajanga on 27 April 1978 and was ordained Bishop the following 2 July. He proclaimed the Gospel in all the parishes of his territory, almost always visiting them on foot. This was often the first time that their Bishop had visited them. The overall area of the Diocese is about 107,000 square kilometres. He was involved in founding the Ecumenical Commission of Theology, and has been entrusted with drafting the statutes of the Council of Christian Churches, a movement that has played a particularly important role in the democratic development of the Malagasy nation since 1989. Named Archbishop of Antananarivo on the 3rd February 1994, he was installed on the following 15 May. Thus he returned to his native Diocese, devoting himself to serving the people with painstaking care and hard work. From 1997 until December 2002, he served as President of the Episcopal Conference of Madagascar. Archbishop emeritus of Antananarivo, 7 December 2005. Created and proclaimed Cardinal by John Paul II in the consistory of 26 November 1994, of the Title of Sts. Sylvester and Martin ai Monti.